telescope in Y-shaped supports. A surveyor's compass is included for precise directional sightings. This wye level was manufactured by the well-known British firm of Troughton & Simms, London. 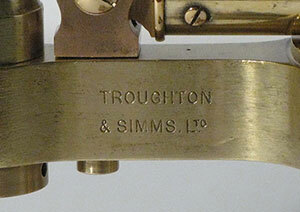 Troughton &Simms was formed when Edward Troughton took William Simms as a partner in 1826. The firm continued in severalcombinations of the two families until 1922, when they merged with T. Cooke and Sons Ltd. of York and renamed the company Cooke, Troughton & Simms. This level was probably made in the late 19th century. It is in full working order, all optics are intact and original, and the lacquer coating has been renewed. The name 'octant' derives from the Latin 'octans' meaning eighth part of a circle, referring to the angle of 45 degrees between the arms of the frame. The scale is divided into 90 degrees, or one fourth of a circle. John Hadley (1682-1744) described an instrument of this sort to the Royal Society of London in 1731 and obtained a British patent in 1734. Accordingly, octants are sometimes known as Hadley quadrants. This is a fine, large mahogany-framed octant with a decoratively engraved 16 inch arm. The arm's engraving depicts a swan among reeds with flowers and foliage.The instrument is in immaculate original condition overall. The brass has been lightly cleaned and the frame has been cleaned and waxed. It includes a custom-made mahogany and brass display stand. This octant is signed Josh. Gaitskill, Wappin (Wapping), London. Joseph M. Gaitskill, NIM (Nautical Instrument Maker) practiced at two Wapping High Street addresses, 123 and 129, between 1793 and 1823. Wapping is just east of Tower Hill and the concentration of 18th-19th century instrument makers. This is a fine horological instrument as well as an attractive garden sundial. It is engraved with a full month-by-month equation of time table around the circumference, in addition to the hours of the day. The gnomon is set at latitude 54° 2' (54 degrees, 2 minutes), considerably north of Dublin where the dial was made. (6) the chapter ring of the hours and the signature. The 12 inch diameter dial plate is weathered but with every feature still very distinct, and no damage. The dial is clearly signed Made by Yeates & Son, Dublin. Samuel Yeates and Son made and signed instruments of all kinds in Dublin with this name from 1832, although Samuel himself died in 1839. The firm practiced under the same name until about WWI. 7. Equation of time tables for all 12 months of the year, with additional panels to read the dial faster or slower against a watch in each month. The central gnomon has an old repair, and one of the auxiliary gnomons is a replacement. 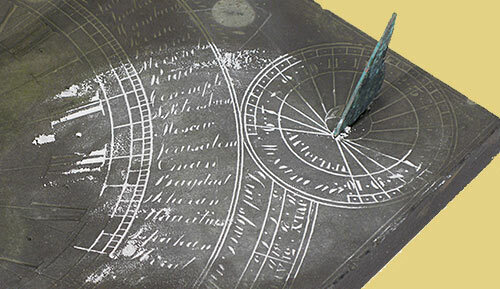 The slate panel is undamaged, and minimally eroded It is nearly all legible with a dusting of chalk. We don't recommend an outdoor installation as the slate has its original surface and is not sealed against acid rain or freezing. At the top (North) of the dial is a Latin inscription that is too worn to read clearly, probably having to do with time and death. The dial is signed Richard Melvin, maker to the Crystal Palace London. He signed and was known by a number of versions of his name. Ricardus Melville and Richard Melvin are recorded for example. There are others but the unique design suggests a single maker. Richard Melville began his career in Ulster from 1832 to 1842. By 1845 he was working in Glasgow and continued there until 1851. In 1846 he was based at 160 Saltmarket Street. Two dials made in Glasgow, both dated 1848, are, respectively in the Dunblane Museum and the Dollar Museum. 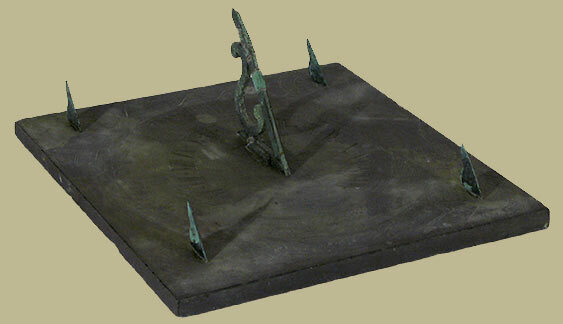 A number of sundials are held by museums, notably the National Museum of Scotland and Armagh Museum, Ireland. In 1856 he was in Liverpool, in 1858 in the Crystal Palace area, London and by 1864 he was working in Dublin. His address there in 1871 was 9 Lower Wellington Street. He is not known as making any other instruments. We are grateful to the British Sundial Society for the biographical information. 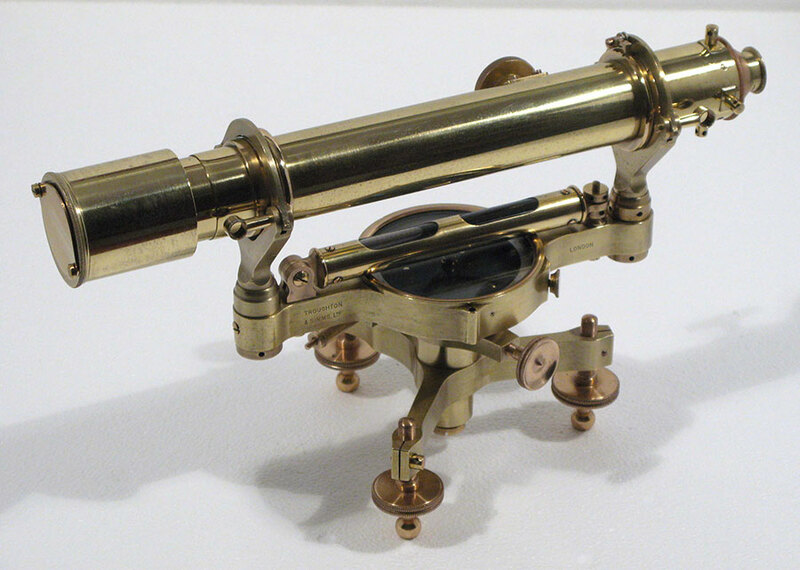 This is a very pretty 19th century brass telescope, all complete, original, and in working order.The original fitted mahogany storage box is only 21" long.The telescope includes a Barlow extension for terrestrial viewing, and two eyepieces of differing field widths. 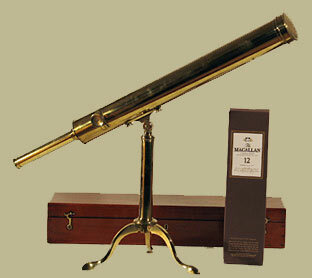 Barrel diameter is 2.25 inches at the objective lens, and the overall length with the Barlow extension fitted is 26 inches. Height is 15 inches. Thomas Harris, Optical Instrument Maker, worked from about 1780 to the early 19th century, and in 1806 the firm was renamed Thomas Harris & Son. They were Opticians to the Royal Family for much of the 19th century. 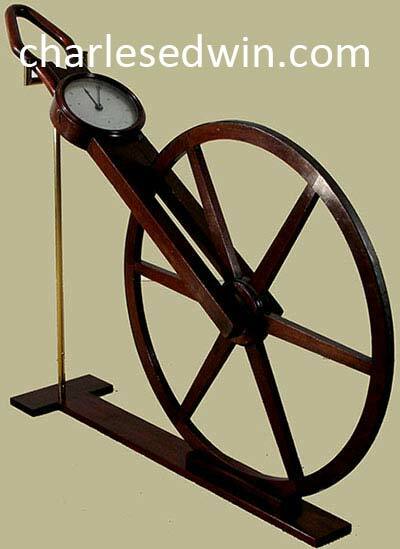 Harris & Son also made very fine barometers and other scientific instruments. Telescopes are difficult to date in a narrow range, but the style of engraving in the signature indicates that this one probably was made around 1840 to the mid-century. Early 19th century mahogany "waywiser," a surveyor's measuring device. Surveyors today use a waywiser (also known as an odometer or a perambulator) to measure linear distances on the ground. This elegant English example in mahogany dates from the early 19th century, and the dial measures in yards (the longer of the two hands), poles (an antiquated term interchangeable with rods, 16.5 feet, 320 poles per mile), furlongs (220 yards), and miles. The iron-rimmed wheel is 31.5 inches in diameter, covering 99 inches with each revolution, or one pole in each two turns, and can be removed for transporting the instrument. 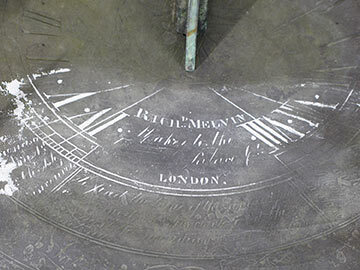 The engraved, silvered dial and steel hands are connected to a clock-like movement, which in turn is driven by an iron shaft running up the inside of one of the wheel supports. The instrument is in good working order, and the display stand is modern. The dial is signed by Robert Bate (1782-1847) of London, MIM and OIM, a prolific maker of instruments in the first half of the 19th century. His workshops produced globes, sundials, drafting tools, barometers, and a wide range of instruments for the Board of Excise and Customs and the Admiralty. He took two of his sons into business with him, renaming the firm Bate and Son sometime before 1840. 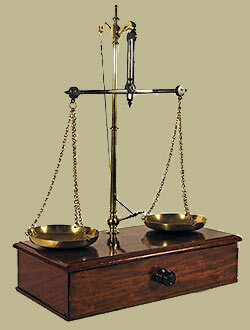 This is a scale in a very nice original condition, still retaining its original set of cup weights. The steel arm, stand, and pans dismantle for carrying in the drawer of the mahogany box, and there is a compartment in the drawer for the weights. Such scales were made for commercial use, in everything from selling spices to pigments for paint. The nine brass weights are in Troy ounces, from 30 down to 1/5th. No maker's name is shown. It is likely to have been made by Avery of Birmingham or a similar firm in the 19th century. Early 19th century ebony octant with brass fittings and the original mahogany box, labelled Henry Hughes, London. The octant is an instrument used by navigators, at sea or on land, that uses a small mirror to bring two images together--those of the sun and the horizon, for instance--to determine latitude by observing the altitude of celestial bodies. It has a fixed arc of 45°, one-eighth of a circle, mated with a scale and reflecting system that measures angles of 90° or more. John Hadley (1682-1744) described an instrument of this sort to the Royal Society of London in 1731 and obtained a British patent in 1734. Accordingly, octants are sometimes known as Hadley quadrants. 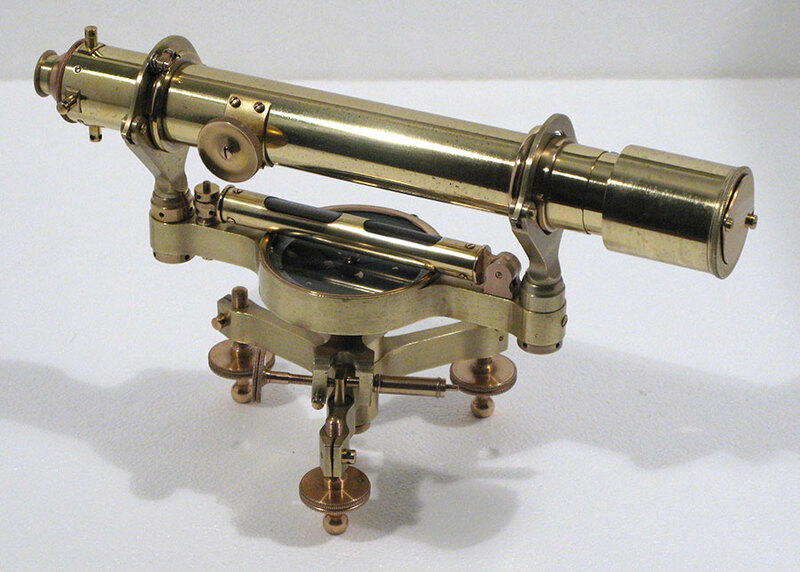 This vernier octant with brass arm is absolutely complete, in very good original condition, and in full working order. The frame is solid ebony and the scales are engraved. The glass elements are all intact and original. While the instrument itself is unsigned, the box bears the label of Henry Hughes, 59 Fenchurch Street, London. Henry Hughes was a second generation instrument maker of repute who began working under his own name about 1830 and moved to the Fenchurch Street address in Tower Hill about 1835. The company is still in existence today.The label denotes Hughes as a maker of "Optical, Nautical, and Mathematical" Instruments. When the frame was dismantled for cleaning, a paper label for the firm of James Gilkerson & Co., 8 Postern Row, Tower Hill was found being used as a spacer under the pivot for the arm. This could actually be the original maker of the instrument itself, Hughes acting as the seller, or from a later repair. The two addresses were within a very few hundred yards of one another; Postern Row no longer exists.